Only the Nasty Party could see the NHS as Britain's Biggest Enterprise. The Tories have under-funded the NHS budget, split up the NHS workforce, brought in management consultants (a group of another 107 it says in the news today), and drafted the Naylor review to sell off NHS assets to make up for their under-funding. The Tory government have REFUSED to tell the public what their sordid plans for transforming healthcare in England were when they first came out - then voted down a Labour motion to reveal the secret transformation plans (like they did with the risk register for the 2012 H&SC act). The Health & Social Care Act [H&SC] opened up access to every NHS service contract to any private [qualified] provider. Not content with auctioning off NHS service contracts, at the same time, they handed over the NHS budget to the private primary sector to commission out as these private entities as they see fit. They called these GP led groups 'buyer-seller groups' or 'commissioning groups'. Then to top it all off, they use the Health & Social care 'Act' to absolve the Health secretary's duty to provide health care to our nation then give 'foundation trust hospitals' the rights to undertake up to half their work in a private capacity. But not to be the eternal pessimist, the health secretary 'congratulated' NHS staff on accepting a pay rise that was actually a real-term pay drop. They are only after one thing. 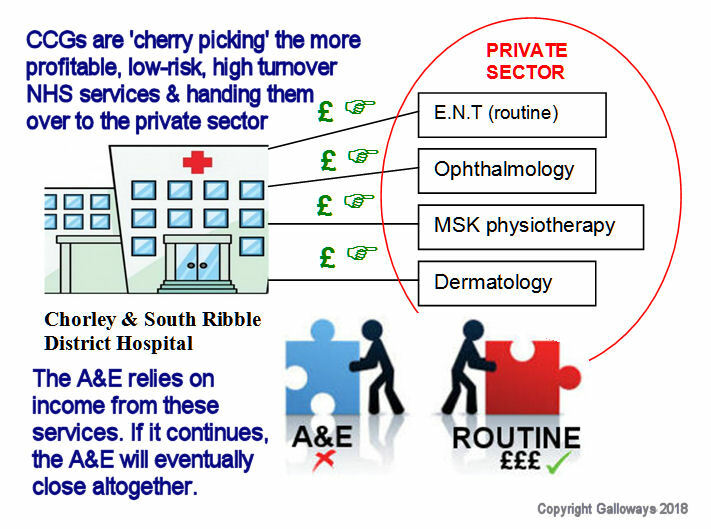 The NHS market along with all its assets. Contrary to what the Tories might say, they want to see the end of ALL public services, particularly the NHS as its something that contradicts their market principles of how commodities are bought and sold. 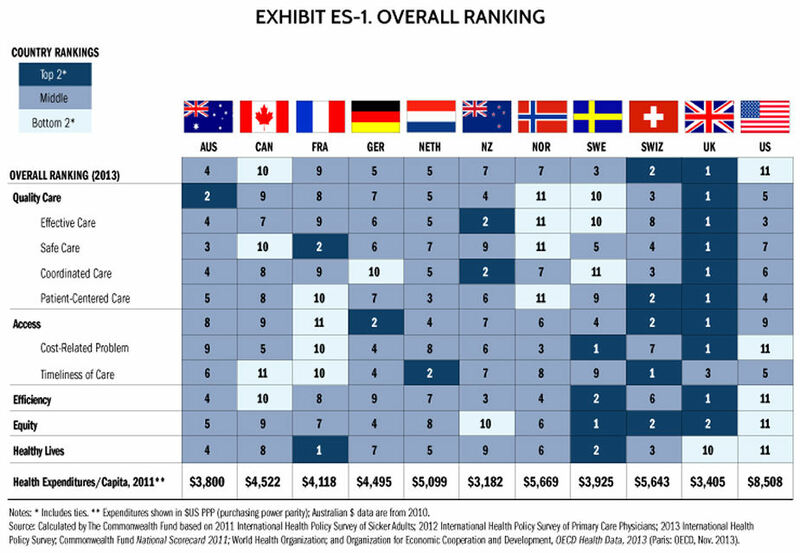 The 2014 Commonwealth Fund report on 11 wealthy countries shows that the UK NHS spends least but ranks first in healthcare performance; the U.S. spends most but ranks bottom. In the US, one in six citizens have no health cover and inability to pay healthcare bills is the primary cause for personal bankruptcies. Despite this, we are witnessing extraordinary, deliberate moves towards a failed US-style healthcare model called Integrated Accountable Care. The NHS has gradually been steered away from its founding principles and the public simply may not be fully aware of just how much. 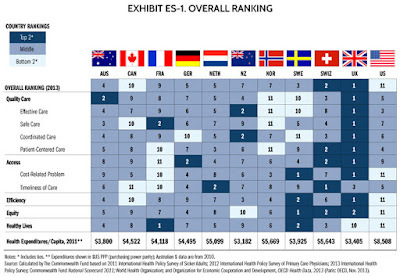 The NHS is not unaffordable. Increasingly Marketised and commercialised, costs have escalated, resulting in inefficiencies and a widening of health inequalities. Health Campaigners in Chorley, South Ribble and Preston now have a much better idea of the disaster that's about to hit local NHS services. Initially, the use of the private sector facilities was to provide NHS Hospital trusts with additional theatre and bed capacity to ensure patients receive timely treatment, particularly when hospitals ran at over 100% capacity (nowhere to discharge patients to = bed blocking). 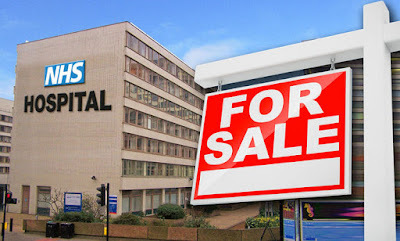 After the intro of the 2012 Health & Social Care Act and consequently CCGs, NHS hospitals have been dealing with private firms to buy and sell patient care and treatment services. In 2015 these were worth more than £1bn, creating a marketplace for commercial healthcare companies in the English health service. Many NHS managers and commissioners at the health melas and 'Our Health Our Care STP events we've attended would say the NHS has been forced down this road. Managers have to deal with waiting lists and a narrowing in the range of operations provided by the state and end up falling back on private operators. This is compounded by the biggest shakeup in decades at a time when the government is attempting to cut £20bn from the NHS budget. Many hospital foundation trusts are gearing up to lure private patients from home and abroad as health budgets are squeezed – a move made possible after the Con-Lib coalition's 2012 H&SC Act which allowed the proportion of income hospitals can earn from paying patients to rise by 5% a year to a maximum of 49% of patient income. Four senior hospital directors resigned from the Lancashire Teaching Hospital NHS foundation trust [LTHT] a few months back, deserting the sinking ship currently in a £43m deficit. And what do we have in return? More executives hired from the private sector importing a new culture into the NHS. More executive managers from the non healthcare commercial sector costing thousands for pie in the sky charts of ambitious 'solutions'. Only they're not solutions, they're just..... well, pie charts. So what of Preston and Chorley hospitals? close one or BOTH A&Es at Preston and Chorley hospitals and have one specialist A&E/Trauma unit replacing them. 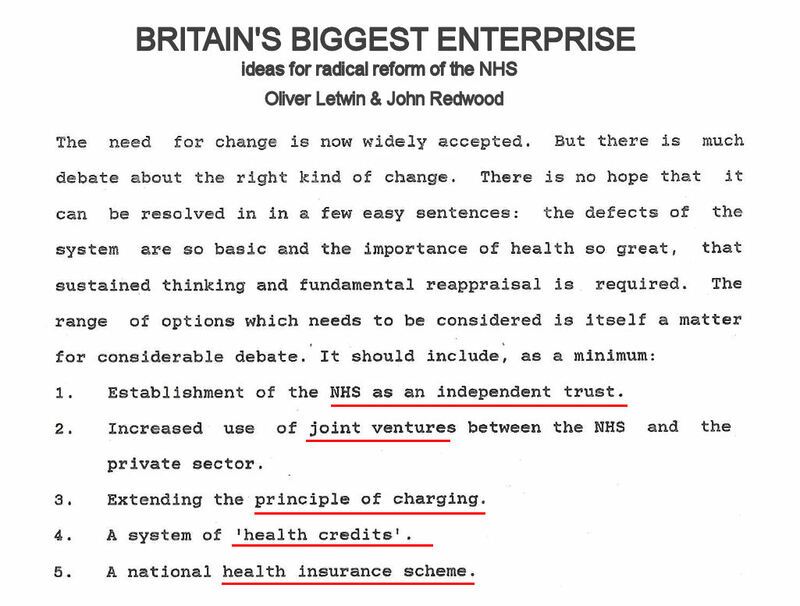 Use other funding sources to 'Transform' the NHS into a sustainable 'two-tier' insurance system: these would be such as Sustainability & Transformation Funding, Local Government Authority grant, PFi2, and sale of public assets (land and buildings as in the Naylor Review). *LGA grant already approved for a Clinic in Preston (see LEP last week). Establish an 'Integrated' care partnership organisation with other health bodies including social care, acute trusts, CCGs, private sector, mental health trust, GP federations,voluntary sector etc..
Introduce personal health budgets Phb. *If a patient spends up their Phb they will have to pay a top-up to extend the Phb. The above isn't an exhaustive list and illustrates how each partnership and its contractual obligations depend on the number of partners and thus types of services they can provide. A true ACO with all partners in the organisation is shown below. But generally the plan is to form the American model of health care provision called 'Accountable Care Organisations' or ACOs for short. GPs, many of who also sit on CCG commissioning groups, and who have made substantial losses in the past stand to profit. They stand to gain with the uptake of specialised teams running community services and the private sector will partner up to help everything along. The GPs and GP federation are also entitled to keep any savings they make from the partnership deal which is an incentive to constantly save money using demand management (rationing) rather than concentrating on providing comprehensive universal healthcare. Many trusts are referring to their STP plans and have admitted that in future hospitals are likely to have fewer beds, as services move into community settings, demand management initiatives reduce the number of patients accessing acute services, and there is more competition for less complex elective services. The re-directing of NHS services into private community clinics is the reason why in 2015-16 the LTHT pulled the plug on a plan to build a multi-storey car park at its hospital in Preston. Knowing there would be fewer services and hence fewer spaces needed it didn't make economic sense to spend on the car park building project. With the public sector in chaos, the private sector remains buoyant. Ramsay health ltd, one of the biggest private healthcare firms, with 22 UK hospitals (one in the Chorley area), reported in its 2012 accounts that "in particular, in the UK, NHS admissions were up 11.3% last financial year and now comprise more than 65% of the total Ramsay UK admissions. Complete sham. On Thursday at the Our Health Our Care public event people were told public consultation would come around March 2019. Yet as mentioned above, the CCG along with the hospital trust and other partners don't need to consult on most of the work; since moving a service out of hospital to another provider doesn't require public consultation. There are some major reconfigurations that do require statutory public consultation. These relate to the Emergency and other services proposed to undergo a major change. These A&Es are the heart of our hospitals, the private sector don't want them as they aren't profitable. Yet once they are gone, live's will be lost, and there will be no turning back. Simon Stevens, the man who used to run the Medicare division of Americas largest private health insurer 'United Health', will have played his part in the 'transformation' of a truly social healthcare system. An ethical and efficient system that provides for everyone no matter what their means, will have been transformed into a mirror image of the profit-making' Accountable care scheme in the USA. 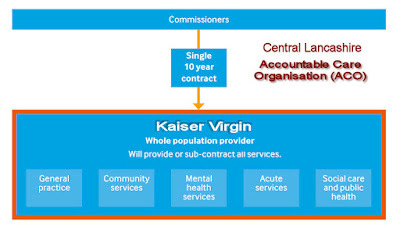 The above is the definition of privatisation by the World Health Organisation (WHO). The privatisation plan for Lancashire & South Cumbria has already begun. The local area plan for Central Lancashire [Preston, Chorley, South Ribble] ineptly titled 'Our Health Our Care' is part of the process where private providers are increasingly becoming involved in provision of health services. The image above shows just a handful of NHS hospital services awarded to private providers by Clinical Commissioning Groups (CCGs). *The latest proposal from the Our Health Our Care program team is to have only one A&E/trauma centre for Central Lancashire. Thus replacing Preston and Chorley A&Es (although Chorley A&E is currently a 12 hour temp A&E). As we can see from the above image, the high-turnover, low risk, lucrative services are moved out of Preston and Chorley hospitals under the Our Health Our Care program straight into the private sector. The Our Health Our Care program calls this 'care closer to home' or 'care in the community'. In reality, it is fragmentation of NHS services primed for privatisation to line the pockets of the commercial health sector. This decoupling of hospital services into private clinics results in fewer resources, funds and staff for the NHS: which in turn means NHS bidding power to get the contracts back into the public sector is seriously diminished. If continued, the NHS will eventually be left with a basic rump state-funded system similar to that seen in 'Integrated Partnerships' in the USA called Accountable Care Organisations (ACOs). This ultimately is what the ex U.S. Medicare director and now head of the NHS wants. 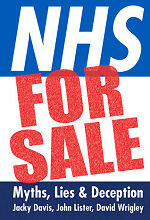 The NHS doesn't need to be handed over wholesale to be 'privatised'. In fact, this isn't what privateers want, as a bulk of NHS services simply aren't profitable (such as acute/A&E services). They only want the low-risk, high-turnover, lucrative services to ensure a profit margin. This is why we are seeing more and more of these lucrative hospital services being moved out of hospitals into private-public clinics (or public surgeries hired out by the private provider). Community services are also a prime target for the commercial sector, as are county run 'Social Services'. For this reason, the means-tested services if 'integrated' into the NHS could result in ALL NHS services becoming means tested. Similar to dentistry we have now, those who can pay will have to pay. A prime example is that of Virgin Assura (now Virgin Care Ltd). In 2010 Virgin had around 60 urgent and community care NHS service contracts, in 2017 however this had risen to well over FOUR-HUNDRED. To prevent the 'rioting on the streets' scenario what the Tories have done is implemented a plan over a longer term whilst keeping the illusion that we still have a public NHS. Although plans to dismantle the NHS have been in place for decades, the Tories themselves needed two consecutive terms of office to set in motion what would to be potentially irreversible decisions. 1 and 2 above are the first term (5 years) the second term is to use the H&SC Act to introduce a new health insurance system. GP - led Clinical Commissioning Groups (CCGs) hold the bulk of the NHS budget - denial of care is now up and running. *Note GP's are private providers operating under an NHS General Medical contract, many were familiar with 'practice-based commissioning' from the Blair Labour era. Out of interest, if you read back over history it was a Tory leader who said "if it was us (Tories) trying to do what new Labour are doing (with the NHS) there would be 𝐫𝐢𝐨𝐭𝐢𝐧𝐠 𝐢𝐧 𝐭𝐡𝐞 𝐬𝐭𝐫𝐞𝐞𝐭𝐬. Denial of care plays a large part in the proposed Integrated/Accountable Care partnership Organisations (ACOs). It comes under the title 'demand management'. Each time an NHS contract is awarded to a non-NHS (private) provider, the NHS funding, and in many cases staffing, shrinks. The NHS in that case will have less and less funds to bid on and buy back the service. 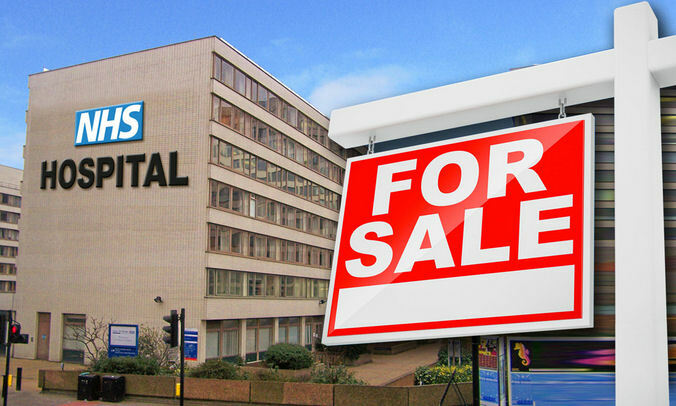 Many hospital trusts could become bankrupt (foundation trusts are prone to this). And over time, particularly over the 2nd term of office, the NHS will have been dismantled. The heist will then have been done. ■ 𝐍𝐨 𝐨𝐩𝐩𝐨𝐬𝐢𝐭𝐢𝐨𝐧, 𝐧𝐨 𝐜𝐨𝐧𝐬𝐮𝐥𝐭𝐚𝐭𝐢𝐨𝐧, 𝐚𝐧𝐝 𝐧𝐨 𝐫𝐢𝐨𝐭𝐢𝐧𝐠 𝐢𝐧 𝐭𝐡𝐞 𝐬𝐭𝐫𝐞𝐞𝐭𝐬. We are now deep into the 2nd term of office. We are now heading towards that American insurance based model of health the head of NHS England 'Simon Stevens' wants. In April 2017, Lancashire Teaching NHS Hospital Trust had a surplus from car parking charges of over £1 million. Yet a few months later the same hospital trust vastly increased car parking charges and also started charging disabled to park at their hospitals in Chorley and Preston. In the same tax year, health Trusts in Lancashire and South Cumbria raked in over £5.1m in parking fees. In the last financial year (2016/17) it was revealed NHS hospitals in England made £174m from charging patients, visitors and staff for parking. 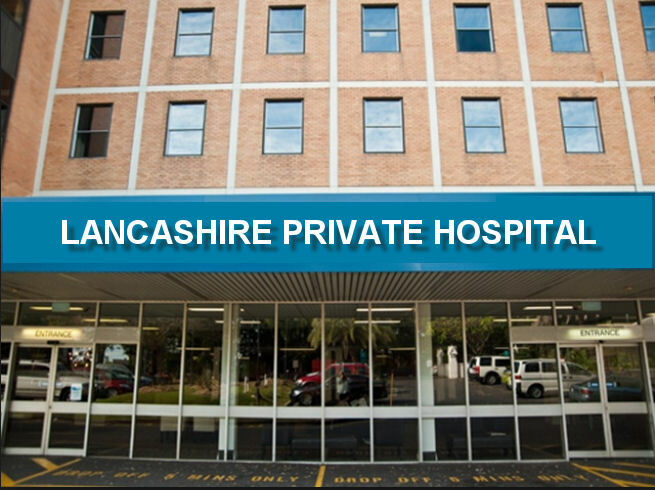 The biggest profits in Lancashire came from the Lancashire Teaching Hospitals NHS Foundation Trust which runs Royal Preston and Chorley and South Ribble hospitals. It collected a record £2,263,000 in 2016/17. Parking fines (charges) amounted to £7,920. The Chief Executive of the Lancashire Hospitals Trust Karen Partington back in December last year claimed that car park management, maintenance and security, cost nearly £1m per year. So if this is the case, with a surplus £1,263,000 in April 2016/17 why did her trust board agree to increase parking charges further in July 2017 - as well as starting to charge the disabled? Not content with making £millions off the backs of the sick and poor, the Lancashire Teaching hospital trust then went ahead and vastly increased their parking charges and started charging disabled people to park in hospital grounds. Even with an excess profit surplus from car parking charges of over £1m, the Hospital trusts new 'tariff' shows that in one case charges were actually doubled. So the question that needs putting to the Chief Executive of the Lancashire teaching hospital trust is: If your trust are profiting with a huge car parking surplus off the backs of the sick and poor, what's to say your trust aren't doing the same with other schemes? Worst of all, due to the apparent greed of the Lancashire teaching hospital trust, the car parking management company have had to recommend an across the board increase to the other hospital trusts they provide facilities to. i.e. the decision by the Lancashire teaching hospitals trust to ramp up car parking charges has had a knock on affect across all hospitals in Lancashire. 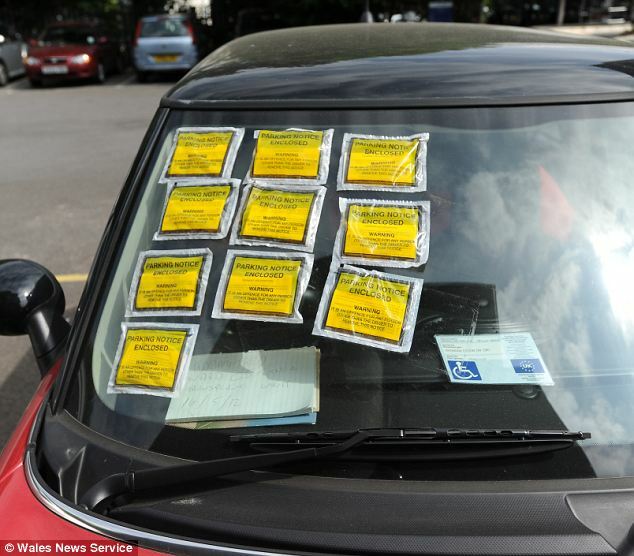 The Department of Health issued a statement saying: "Patients and families should not have to deal with the added stress of complex and unfair parking charges. NHS organisations are locally responsible for the methods used to charge, and we want to see them coming up with flexible options that put patients and their families first." • Blackpool Teaching Hospitals NHS Foundation Trust raised £1,662,000 in parking fees in 2016/17. East Lancashire Hospitals NHS Trust, which has a PFI (Private Finance Initiative) contracted out service, said it gained £100,021 in fees in both 2016/17 and 2015/16. In 2015/16 Lancashire Teaching Hospital Trust’s “income” from parking fees was £2,218,000, with £11,100 gathered in parking fines (charges). Wigan Council was left with an £829,000 kitty from surplus parking revenue in a 12-month period, new figures have revealed. 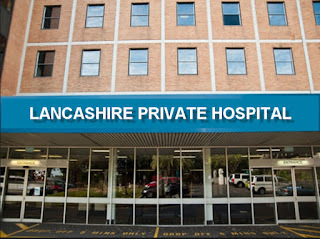 Campaign group 'Protect Chorley Hospital from Cuts & Privatisation' have been lobbying the Lancashire hospital trust to rethink the disgraceful decision to charge the disabled and bring the car parking charges down or remove them altogether. A petition is currently being circulated, for more information please visit the campaign media facebook group here. Dear reader. 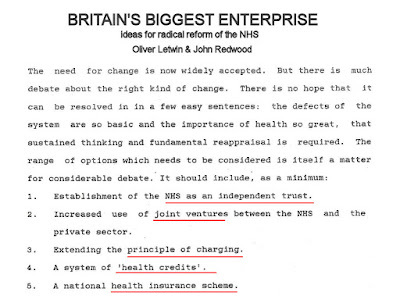 In 2005 the Health minister Jeremy Hunt co-authored a policy book calling for the NHS to be 'denationalised' [privatised] and replaced with a health insurance system. Due to rapidly increasing demands placed on the NHS, this new 'Accountable Care' system was put in place on the 4th December 2021. This could not have been possible without the help and experience of Sir Simon Stevens, the ex vice president of the largest private health insurer in the United states, UnitedHealth. Mr Hunt appointed Mr Stevens as Chief of the NHS in 2014. Mr Stevens' experience of working on the U.S. Medicare scheme has enabled the NHS to take better rein of out of control finances and reduce hospital stays bringing more integrated partnership working into the NHS. Thank you for choosing Chorley & South Ribble Integrated Care Partnership as your preferred Healthcare provider. Please see below an information leaflet regarding part of your healthcare plan. A 'co-payment' is a fixed amount of money you pay for a certain health & social care service. The NHS pays the rest of the cost. Co-payments are worked out in percentages. The 'Accountable Care Organisation' (ACO) currently operating in your area is C&SRP (Chorley & South Ribble Partnership). 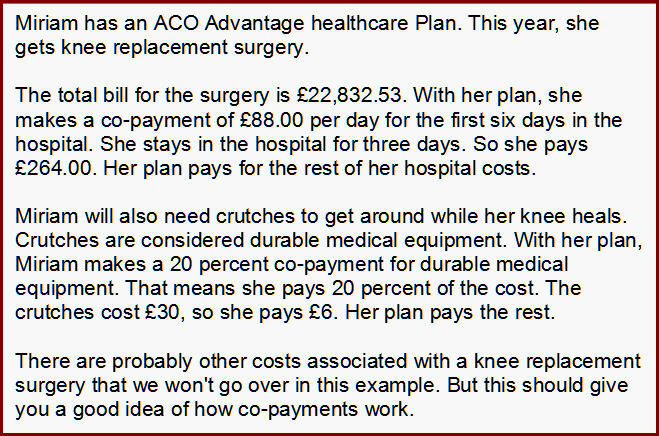 Your ACO 'Advantage' plan supplements the costs of NHS treatment and medicines (except prescriptions which are charged at the full cost, which is currently £10.80 per item). The co-payment system is operated by your regional NHS Clinical Commissioning Group who along with your healthcare providers, are partners in the Accountable Care Organisation (ACO) for your area. Your ACO uses co-payments for most Healthcare services. You make a co-payment of 20% for most services provided by your ACO healthcare provider system. Here's an example of how co-payments work with your ACO 'Advantage' plan. 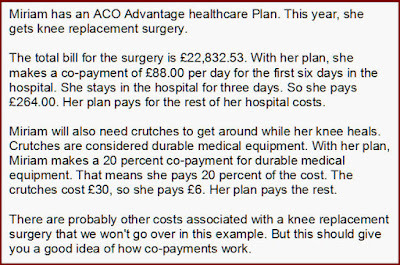 Note: The example shown above is from the actual Medicare webpage with $dollars converted to British £pounds. How do copays, coinsurance and deductibles work with Medicare plans?